an estimate of 3.4 million individuals die every year because of problems related to overweight. An increasing number of cities has been occupied by huge highways and roads exclusively for cars, leaving little to no space for citizens interaction. We feel trapped in cities that revolve around the car, not people. Like for many others, one of my first memories is learning to ride a bike. I remember finally mastering the ancestral artifact after multiple falls and stumbles. Learning to ride a bike is, in my memory of the past, one of the first moments of freedom and independence. However, when I grew up, the bicycle disappeared from my environment. It stopped being part of my everyday life. It became an instrument of the past living in oblivion in the garage of my Medellin house. Medellin is a city where a car is a symbol of success. Then I moved to Bogota, and realized that life in the city can be different. When I experienced a “day without cars” for the first time, I decided to look for another way to go to school and chose the first transport I mastered, the bicycle. Biking from home to school, I felt and lived the city in a new way. I found new streets, places and colors. After this first experience I started enjoying other spaces, and one of them was the “Ciclovía”, where more than a million people take the streets for walking and pedaling one day each week. The streets no longer belong to cars and are transformed into a public space for everyone. I also found citizen groups that took the city at night every week. With the bicycle I found not only a new way to travel around the city, but also new stories and people making a change. With time and every ride, my passion for bikes grew. I was convinced that the bicycle was improving my quality of life and my environment. I transformed from a car-centered citizen to a citizen living the city in two wheels. The city became a space for freedom, and riding my bike became one of the happiest moments of my day. 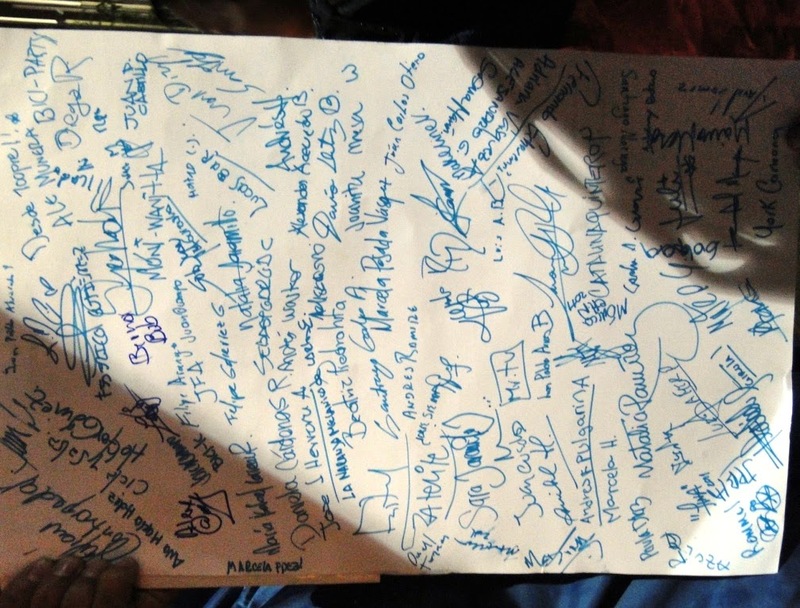 After my studies, I returned to Medellin and participated on a citizen movement in which more than 150 persons signed a Bicycle Manifest in 2011. 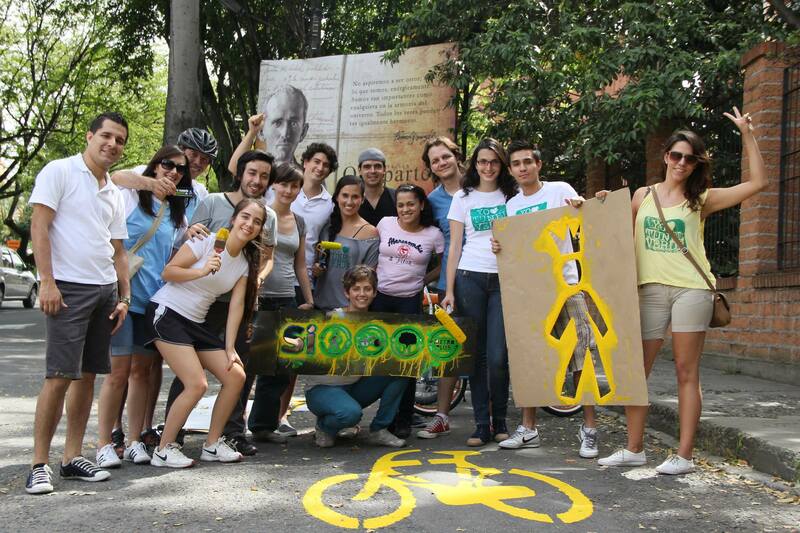 With this symbolic document, we were trying to make the bicycle a priority for the city of Medellin. That same year, different groups promoting the bicycle and sustainable cities were born. Using social media and creative solutions, we envisioned the city we dreamed of. 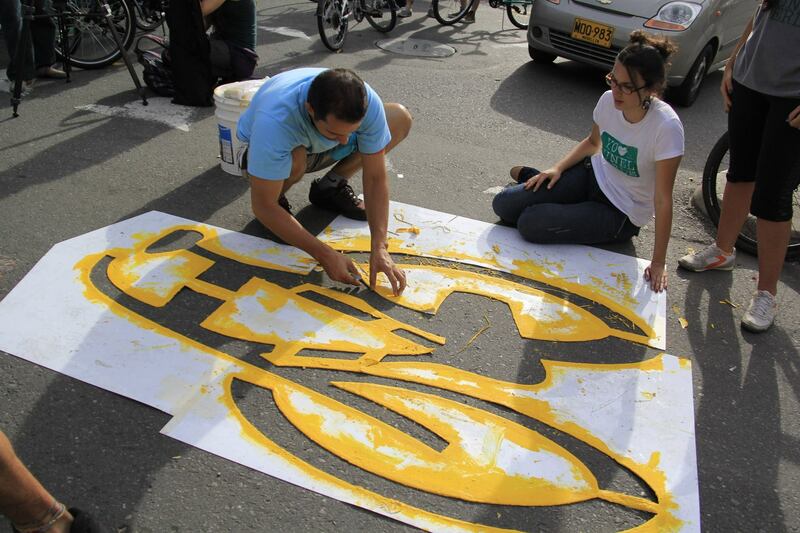 We painted citizen bike lanes with the help of many neighbors (BicisPorLaVida). We created spaces to learn about the importance of the bicycle and many of the groups started moving thousands of persons in bike rides. The sum of these actions resulted in a new vision of the city and a new collective conscience on the importance of biking. Then, we witnessed how the public sector created new spaces to promote and use bikes. By the end of 2011, Medellin opened the first bike share system (EnCiCla) in Colombia, which now has more than 10,000 users who have made more than 700,000 trips. The Mayor also approved a new plan for the distribution of land, where there is a plan for 400 kilometers of bike lanes and where bicycles are a priority, along with pedestrians and public transportation. However, Medellin is not yet the dream city many of us want. It is the Colombian city with more cars per capita, and one of the cities getting more new cars each year. 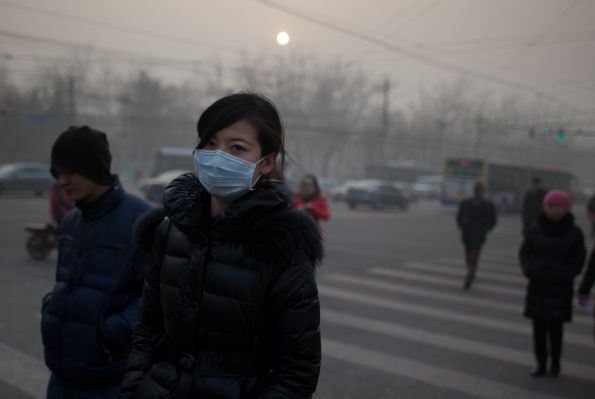 Every year, more than a thousand people die due to chronic respiratory diseases and 104 of people dying in accidents are pedestrians and bikers. Only 1% of trips are bicycle trips, and new generations still risk leaving their bikes in the garage if we don’t do anything. Still, we have critics calling us crazy hippies because we promote the bicycle. They say that this is not Europe, and that our country is different. The best way to keep moving is to find more arguments and propose creative actions. Also, we should invite critics to bike around the city so they can live and feel how the bicycle can change the city and their quality of life, just like it did ours. 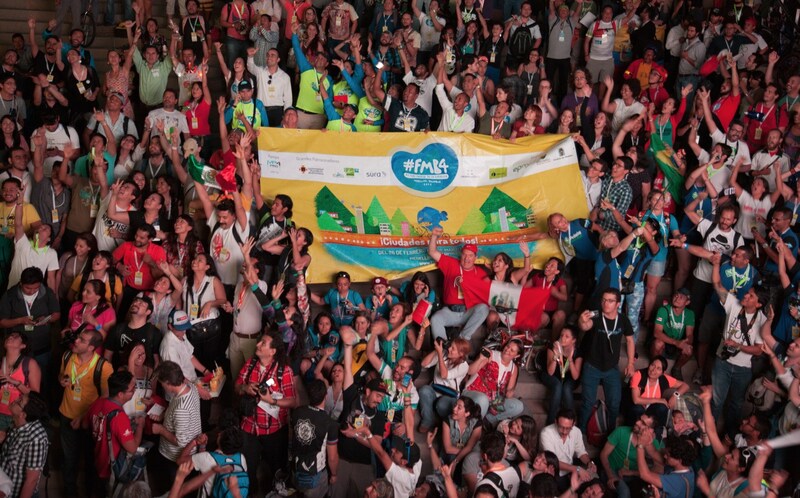 This year we hosted in Medellín the World Bicycle Forum. Nearly 6,500 participants from over 40 countries gathered under the theme “Cities for All” making it the largest bicycle event in history. The FMB4’s 45 panels, 30 workshops, nightly group rides and numerous artistic and urban interventions were organized in a collaborative and independent manner through the volunteer work of inspired citizens from around the globe. 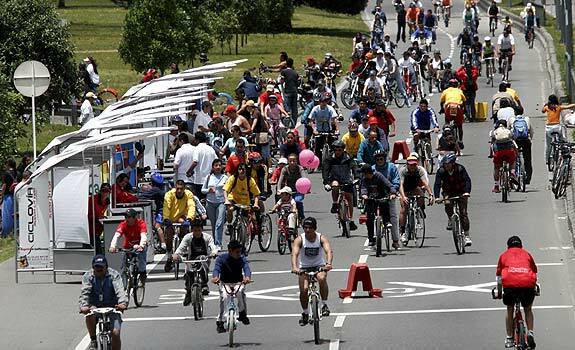 The event resulted in the creation of the national cyclist network (BiciRedColombia) and the municipality compromised with the creation of the Secretary for the Bicycle. This journey is not an easy one but, no doubt, if we pile on the efforts, we can ride towards a more sustainable, healthy and friendly city. Cities are not only transformed through governments, it’s us, the citizens, who change them through our actions. We need to unite efforts to build the city we dream of. 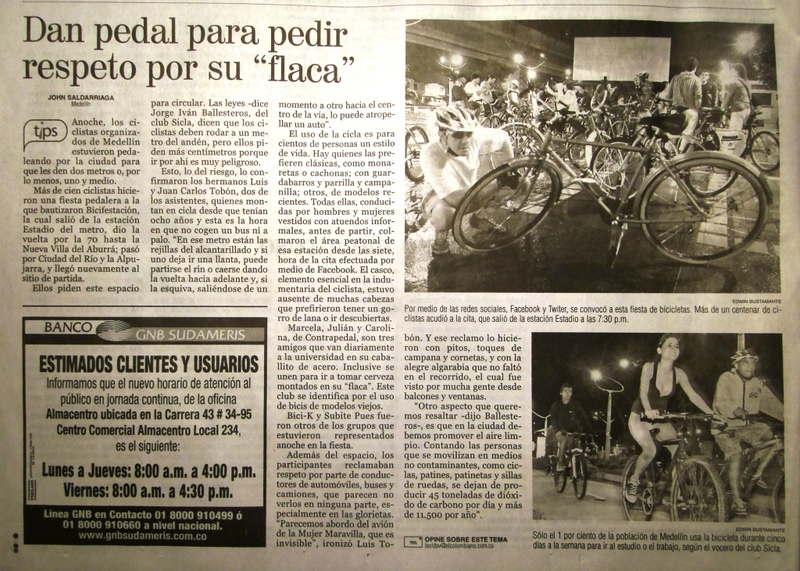 Article published originally in La Vuelta al Mundo en 80 Bicicletas of Derive Lab.